This historic congregation was organized in the 1840s. In 1859, the Goliad Circuit of the Methodist Church reported 166 members, the largest membership in the Rio Grande Conference. 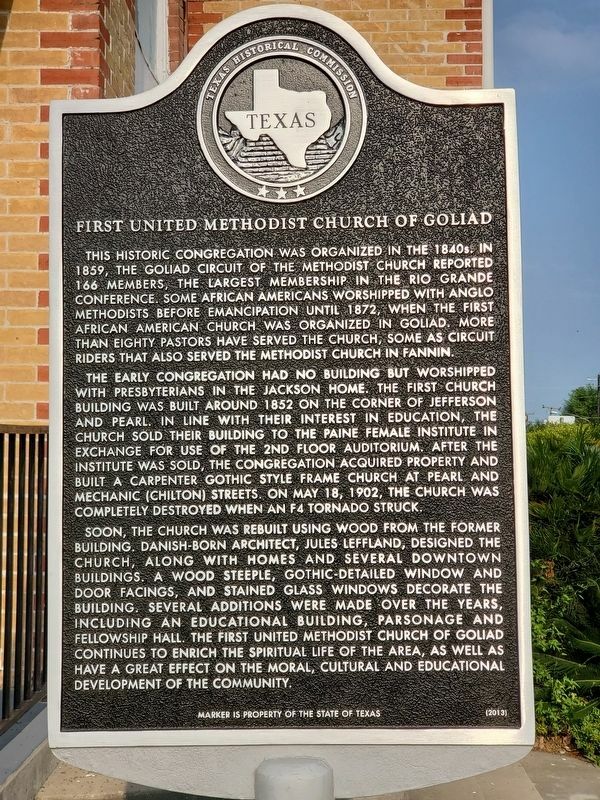 Some African Americans worshipped with Anglo Methodists before emancipation until 1872, when the first African American church was organized in Goliad. More than eighty pastors have served the church, some as circuit riders that also served the Methodist Church in Fannin. The early congregation had no building but worshipped with Presbyterians in the Jackson home. The first church building was built around 1852 on the corner of Jefferson and Pearl. In line with their interest in education, the church sold their building to the Paine Female Institute in exchange for use of the 2nd floor auditorium. After the institute was sold, the congregation acquired property and built a Carpenter Gothic style frame church at Pearl and Mechanic (Chilton) streets. On May 18, 1902, the church was completely destroyed when an F4 tornado struck. along with homes and several downtown buildings. A wood steeple, Gothic-detailed window and door facings, and stained glass windows decorate the building. Several additions were made over the years, including an educational building, parsonage and Fellowship Hall. 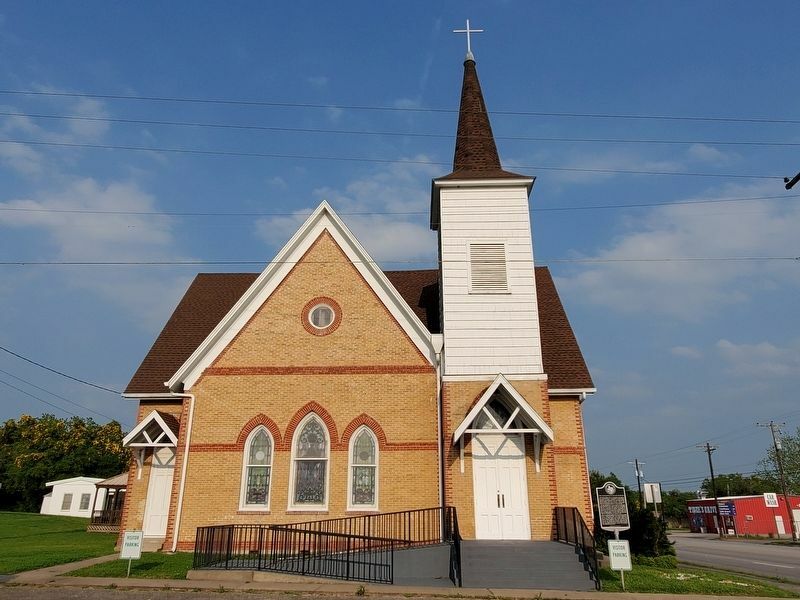 The First United Methodist Church of Goliad continues to enrich the spiritual life of the area, as well as have a great effect on the moral, cultural and educational development of the community. Location. 28° 40.102′ N, 97° 23.628′ W. Marker is in Goliad, Texas, in Goliad County. Marker is at the intersection of West Pearl Street (U.S. 59) and North Chilton Avenue, on the right when traveling west on West Pearl Street. Touch for map. Marker is at or near this postal address: 134 West Pearl Street, Goliad TX 77963, United States of America. Touch for directions. Other nearby markers. At least 8 other markers are within walking distance of this marker. St. Stephen's Episcopal Church (about 400 feet away, measured in a direct line); Founding Site of First Baptist Church of Goliad (about 800 feet away); Goliad (approx. 0.2 miles away); Goliad Tornado of 1902 (approx. 0.2 miles away); The Hanging Tree (approx. 0.2 miles away); Market House Museum (approx. 0.2 miles away); Santa Anna's Surrender Ratified (approx. 0.2 miles away); Goliad County Courthouse (approx. 0.2 miles away). Touch for a list and map of all markers in Goliad. More. Search the internet for First United Methodist Church of Goliad. Credits. This page was last revised on April 16, 2019. This page originally submitted on April 11, 2019, by Brian Anderson of Kingwood, Texas. This page has been viewed 31 times since then. Photos: 1, 2. submitted on April 12, 2019, by Brian Anderson of Kingwood, Texas.